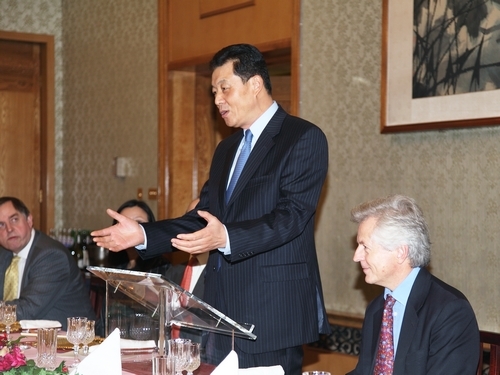 It is a pleasure for me to host this lunch for you before you set off this weekend for the 6th China-UK Leadership of the Future Forum in Beijing. I understand some of you have been to Beijing several times and are veteran delegates to the Forum. But, whatever your experience of China your visit this time is of special significance as it creates two "firsts". 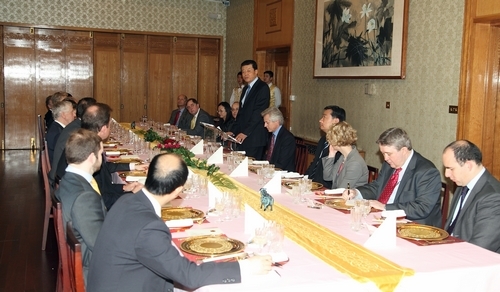 You are the first British delegation to visit China in 2013. You are also the first UK delegation of politicians to visit Beijing after the 18th Congress of the Chinese Communist Party. The 18th Congress is of vital importance. I was honoured to attend the Congress. In my observation, it is important in four aspects, which I characterize as four "NEWs". First, it elected a new leadership with Mr. Xi Jinping as General Secretary of the Party. Second, the Congress confirmed what we describe as a new theory for development. This is a scientific outlook on development. I know that many western people have a challenge grasping the meaning of this theory. I will try and clarify in this way. The scientific outlook on development puts people first and stresses comprehensive, coordinated and sustainable development. · Double GDP and per capita income by 2020 compared to the 2010 level. · Build China into a well-off society by the centenary of the Communist Party of China (in 2021). · Build China into a modernized country that is rich, strong, culturally advanced and harmonious by the centenary of the People's Republic (in 2049). · Shift the economic growth model from export to greater domestic consumption. · Improve the quality of people's lives. · Uphold social equity and justice. · Enhance cultural and public diplomacy. I am sure you will gain a deeper understanding of what the 18th Party Congress means for China through your visit. 2012 is just behind us. China-UK relationship experienced both progress and twists and turns in the year. It went through both ups and downs. There were both happy and sad times. Looking ahead to 2013, we hope that China-UK relationship will have more ups and less downs. We hope it will bring more happiness and less sadness. As an old Chinese saying goes: "It all depends on human effort." The growth of China-UK relations requires efforts across all sectors from both China and UK. In particular it needs political leaders to play a statesman like role. The spirit of the China-UK Leadership of the Future Forum shows what is possible. Over the five years since its launch in 2007, the Forum has worked exceptionally well as it has been committed to the principle of equality and mutual respect. The Forum is designed to seek common ground while shelving differences, increase mutual understanding and draw on each other's strengths. I take this opportunity to congratulate the organisers of the Forum. They are the International Department of CPC Central Committee and Great Britain-China Centre. It is their close collaboration that has created this successful series of annual Forums. As the first British delegation to visit China in 2013 I send you my best wishes. I hope you will bear in mind the purposes of the Forum and build on the success of the Forums of previous years. By doing so you will contribute to the improvement of China-UK political mutual trust and to the growth of China-UK relations. In about one month we will be celebrating Chinese New Year, the year of the Snake. In Chinese culture the snake symbolizes good fortune, longevity, happiness and wealth. I wish you all good health and a happy and prosperous year of the Snake! I also wish you a pleasant and successful visit to China!